Chef Burak Epir of Pilita Grill restaurant in San Carlos, California, serves this Turkish-style sauce over lamb meatballs skewered with chunks of eggplant. 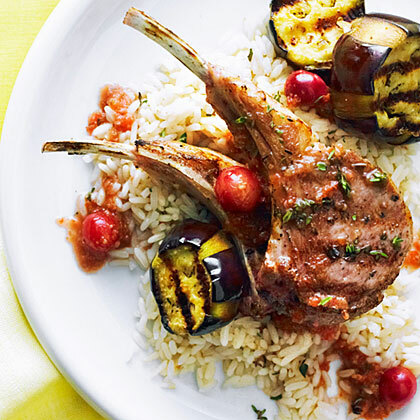 We've grilled lamb chops instead, for a faster but equally delicious version. Heat a grill to high (450° to 550°). Sprinkle lamb with thyme, 1/2 tsp. salt, and the pepper. Rub with oil and set aside. Pulse poblano, tomatoes, garlic, remaining 1/2 tsp. salt, and half the grapes in a food processor until smooth. Pour mixture into a medium saucepan. Cook over medium-high heat, stirring occasionally, until boiling. Add remaining grapes; cook 2 minutes. Grill chops, turning once, 5 minutes total for medium-rare. Serve over steamed rice with eggplant and sauce. Any leftover sauce keeps, chilled, up to 2 days.